Looking for Italian Wedding Ideas? 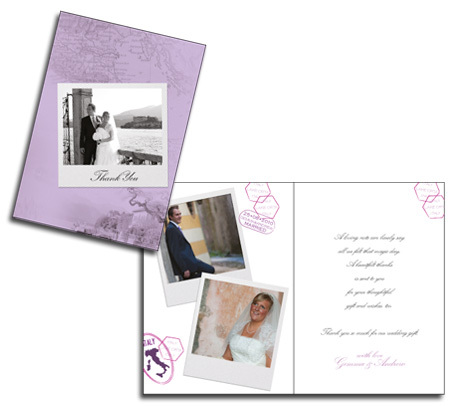 I created the perfect Italian wedding stationery for Gemma and Andrews wedding in Lake Orta including a luggage tag save the date and beautiful lilac wedding passport. Gemma had some great Italian Wedding Ideas as she had already done a lot of her own research. She first came to me wanting to create a Unique Save the Date Luggage Tag and matching Passport Invitation. 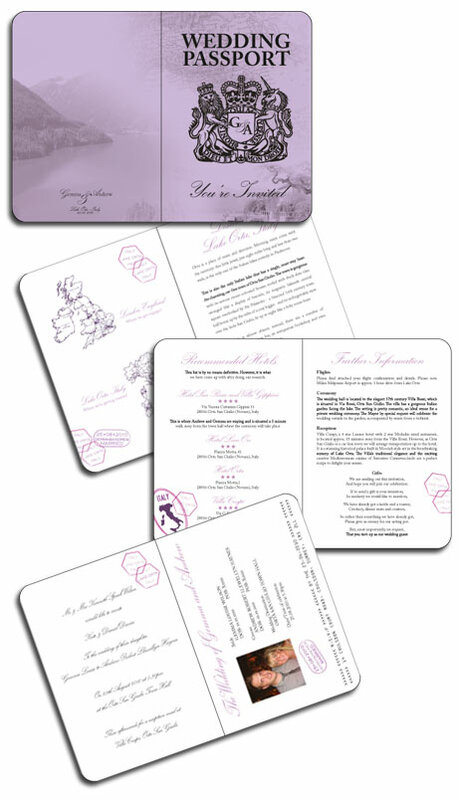 Eventually an entire matching set of destination wedding stationery was created including Postcards and Information Cards for their UK reception and beautiful Thank You cards which included some of their gorgeous wedding photos. Although it's not customary to request an RSVP to a Save the Date, Gemma and Andrews guests were lucky enough to be having their transport to Italy arranged for them so it was vital they included an RSVP to ensure they could get an idea of who could make it to the celebration. I designed a folded Luggage Tag with a tear off section which could be mailed back with the relevant info. Gemma needed to know the date they would like to travel as well as their closest airport. The Luggage Tag was finished off with a white ribbon and mailed out to guests. I think it's a great example of how to word the difficult subject of Wedding Gift Lists. For more examples of how to bring up the subject of Gifts in your invitations read more examples here. The next item I worked on with Gemma and Andrew were the invitations for their UK wedding reception. A postcard was perfect and certainly in keeping with their Italian Wedding Ideas. 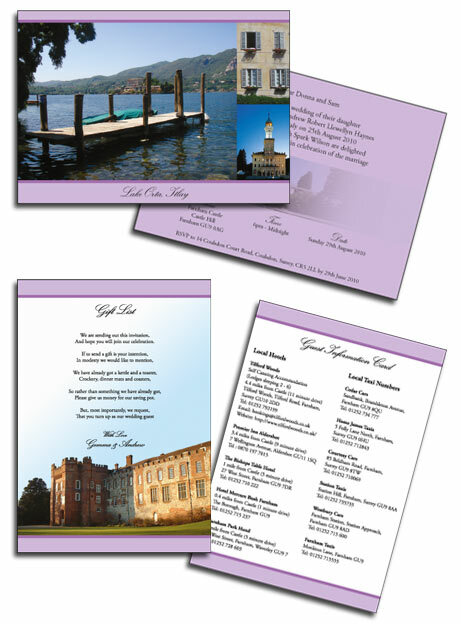 I designed it to look like it was from their wedding location in Lake Orta, it continued the theme beautifully. Gemma also wanted to include a list of local accommodation as well as taxi numbers so these were added to a separate double sided information card and included along with the invite. I'm sure the extra information was really appreciated by their guests. "Oh my goodness, we love Kate and all her wonderful designs. With a very, very limited brief (Lilac is our colour and the Italian Lakes is our destination) she has produced a full suite of gorgeous wedding stationary and we are eternally grateful for adding something very special and unique to our wonderful day. I think everyone will talk about invites for a long time. We had a luggage label save the date, a passport invite for our wedding in Italy, a postcard invite for our wedding reception at Farnham Castle including a guest info card and finally our thank you cards!" Italy gives couples so many different options for their Destination Weddings. From gorgeous town ceremonies to the lakes, beaches and more. Why not consider utilizing a professional to help discover the possibilities Italy as a wedding location has to offer. I recently had the pleasure of meeting the lovely Gio from Accent Events, a wonderful Wedding Planner who runs a leading UK and Italy based company. She has experience planning every type of Italian Wedding and is an expert at finding a unique location which will fit beautifully with your vision of your Italy Wedding. Contact Gio directly by visiting her website Accent Events or completing the form below, she'd be delighted to answer your Questions on Planning an Italian Wedding. Have other Italian Wedding Ideas you'd like to discuss? Please click here to contact me and together we can create something unique for your Italian Wedding. I'll keep adding more Italian Wedding Ideas to my site so check back soon or alternatively browse other Passport Invitations.